Cassell's Hamburgers--a Los Angeles institution with a reputation for excellence. Yelp and Gayot.com were all over this place. They both touted it as one of the best burgers around. Side of Fries, Fat Bruce Lee, and I made the trek to Koreatown to try the best burger in LA--take that back---The World's Best Hamburgers---that's what the sign said. Sweet, sweet advertising--the one thing that you can trust. Cassell's was a simple setup. Scoop the condiments into paper ramekins or onto the burger. Find an table and eat. The Beef: Simple, bright red, and freshly ground--not a hint of aging. The patties were loosely packed and preformed. I would guess that the patties were formed on site, since commercial processors are not good at shipping loosely packed patties. It was probably an 88:12 chuck, and since the American cheese in the reach-in cooler was from Costco (Kirkland brand), it's wasn't a huge stretch to guess that the beef was the 12% fat ground chuck that they grind on-site and sell at Costco. Some reports suggested that they ground their beef on-site. If that was the case, then they wasted their time, since it tasted like bland, Costco hamburger meat. Meh. The Sear: Damn--they had a massive and beautiful pull-out broiler that was capable of imparting a magnificent sear as it drained away the excess fats from the sizzling patties. Well, that's what could have happened with that piece of kitchen equipment. 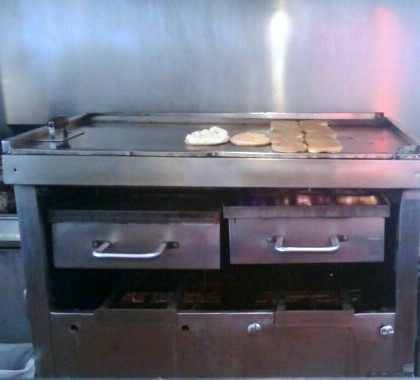 Sadly, both the griddle and broiler flames of this device were set too low to properly sear the beef, so the burgers were a little rubbery as the low heat more braised than fried them. This meant that the loose packing of the patties was for naught. There was not a hint of crunch on the surface of the meat. That was a waste of excellent equipment. The Preparation: Meh--they tossed the patties onto the pull-out broiler, flipped them once, let them reach Well Done, and transferred them to the toasted buns. The Seasoning: None--none at all. Meh. The Bun: It was toasted on the top griddle--no oil. The bun was big, dry, and bland. It was completely uninteresting and added no value to the dish. Meh. Meat to Bun Ratio: There were two patty choices. 1/3 pound and 2/3 pound. I went with the former, because I was not ready to die. In this case the bun overwhelmed the dryish, lean, over-cooked beef. My companions had similar issues with the larger patties, and they slathered their cheeseburgers with condiments to moisten them enough to choke down. The Fries and Onion Rings: Not a hint of seasoning, but they were cooked properly. The Value: Pretty awful--I was out $12 and change for onion rings, and soda, and 1/3 pound Costco burger. Meh. Burger Review : Cassell's Hamburgers was nothing special--it was completely unmemorable. 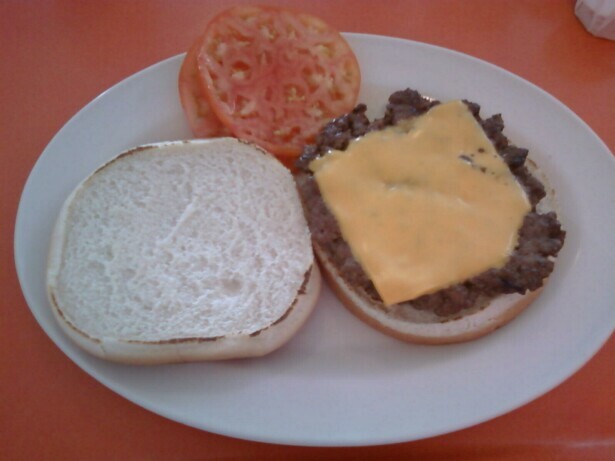 They prepared average and bland ingredients in an average and bland fashion, and they delivered an average and bland cheeseburger. Meh.